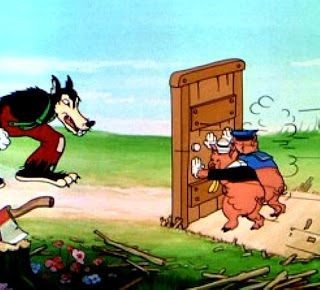 One Eternal Day: "The Three Little Pigs"
You’re probably familiar with the story: a big, bad wolf threatens to destroy the homes of three individual pigs. There’s a lot of huffing and puffing on the wolf’s part, but he can only blow over the two homes that were constructed with straw and sticks. “ …one of the most fundamental messages of ‘The Three Little Pigs’ is that it belittles straw and stick homes and the ‘lazy types’ who build them. On the other hand, the story extols the virtues of brick homes, suggesting that they are built by serious, hardworking people and are strong enough to withstand adversity. I'm doubtful about the advisability of identifying non-Western peoples with pigs. And, of course the villain of the piece is a wolf, an endangered species [although perhaps not in northern Wisconsin], portrayed in a distinctly unfavorable light.